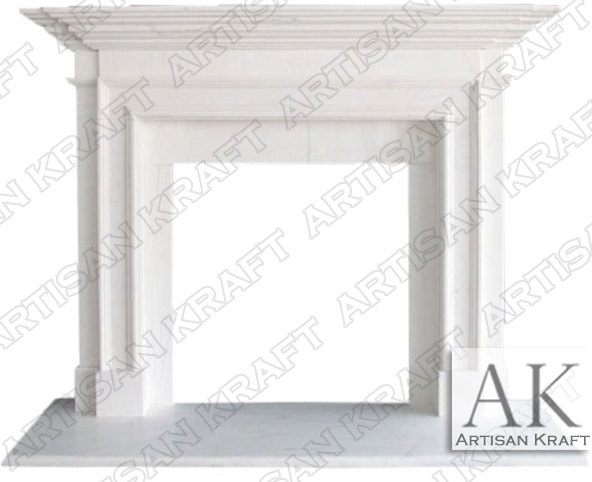 Traditional 2 white marble mantel surround is simply perfect. A contemporary design that has a traditional feel. Even straight lines and steps symmetrically framing the firebox. This style is ageless it fits in a traditional and modern home. This classic design is always a great choice. This mantel looks great in honed black also. The honed finished is different that the polished finish. Honed gives it a flat or matte look making the fireplace even more modern. In stock and on Sale Click Here. Typical Dimensions: 67″ wide x 48″ high *can be made to custom dimensions. Stone: Marble, limestone, precast, sandstone, etc. Available in many different colors, textures and finishes.